Fibers occur naturally, which can be modified and they can be synthesized. Their additions to other polymers impact the threadlike properties on them. Van der Waals forces, hydrogen-bonding, and cross-links are the most important intermolecular forces that influence formation of fibers. They are thread as, spun, woven, long and thin materials. Obviously happening fibers comprise cotton, wool and silk. They lie extended out along side each other permanently through great tensile strength [can be pulled in the direction of the chain], because fibers are linear. They impart strength when they are inserted to plastics. Strength of the chemical links in the chains determines strength of the fiber polymer. Strong intermolecular attractions exist between chains, this disallow it from slipping and returning to random loops and coils, and gives it high degree of molecular orientation [not necessarily crystalline]. Enthalpy prevails over entropy in fiber polymers. Van der Waal forces are strong sufficient to sustain alignments as seen in stereo regular chains of isotactic polypropylenes fitting mutually. The significant intermolecular forces in fibers are van der Waals forces, hydrogen-bonding, and cross-links. They make fibers to be simply pulled (through tensile strength). Therefore they can be woven and spun, to impart strength on materials. When drawn the polymeric material in fibers are stretched, fiber molecules are lined-up permanently. This tendency is supported via the strong intermolecular attractions and is responsible for enthalpy overcoming entropy, unlike in Elastomers. Elastomers have elevated degree of elasticity and can be deformed while it still keeps its original shape. Its molecules are lined up as in fibers, but on stretching to deformity, chains of Elastomers don't remain extended and aligned but return to their original random conformations favored by entropy. They do not remain aligned since the intermolecular forces necessary to hold them this way are weaker than in fibers. Generally Elastomers do not have highly polar groups/ sites for H-bonding. As well extended chains don't fit mutually sufficient for van der Waal forces to do the job. Natural fibers enclose wool, cotton and silk. Examples of synthetic polymers include polyamides [nylons], polyesters [Dacron, terylene, and vycron], polyacrylonitrile [orlon, acrilan], polyurethanes [spandex, vycra] and isotactic propylenes. Their structures have been previous seen. Rayon one of the 1st helpful fibers synthesized in the year 1865 is an instance of fibers that are long silk-like shining strands. They were progressed on via Louis Chardonnet and introduced to Paris in France in the year 1891. The word "rayon" is from ability of the fiber to shine. 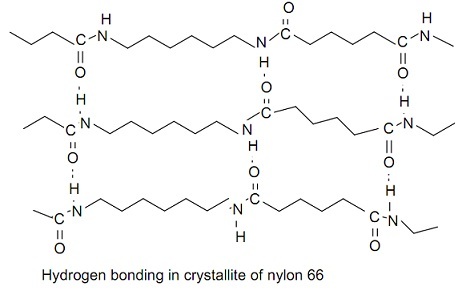 Another instance of synthetic fiber is vinyon, a copolymer of chloroethylene and ethenyl ethanoate. It has huge strength but of limited utilizes since of its low softening temperature of 650C.